adheres to the relevant laws and hygiene requirements. We require all employees to stay consistent with the PDCA* cycle as the basic approach for process control and continuous improvement. ISO 9001:2015 sets out the criteria for a quality management system. This standard is based on a number of quality management principles including a strong customer focus, the motivation and implication of top management, the process approach and continual improvement. 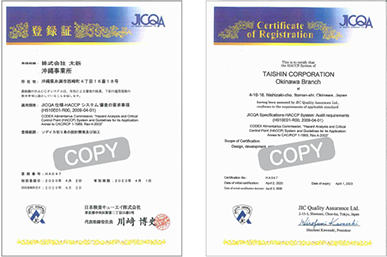 Our ISO 9001 certificate assures our partners and customers the quality of our products, and all is conducted in accordance with the specified procedures. 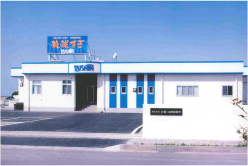 We monitor the quality based on regulations set for each product specification. Devices such as metal detectors respond to microbes, metals and any other impurities in order to meet the strict quality standards of the marine product industry. 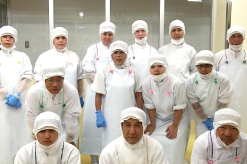 Hairnets, gloves, uniforms, and appropriate footwear must be worn at all times in the facilities. Upon entering the production area, hands must be washed and sanitized. Lint rollers and air showers are also installed at the entrance to remove any dust and bacteria. The plant is cleaned daily based on the ISO manual. The Quality Control Officer is in charge of leading all members in the plant to properly clean under the ISO procedures. Equipment is maintained in a clean, efficient state and in good repair to guarantee product quality and the safety of our people. A record-keeping system tracks the flow of the product through production, processing and distribution. The data is saved and available at all times. Labelling is carefully conducted and checked according to the JAS laws (Japanese Agricultural Standards) and other standards related to food production methods, quality and labelling. We check in frequently with producers and buyers to discuss current conditions and any ways for further improvement.